Spring schedule for the Edvina Masterclass – learn SIP and Kamailio! 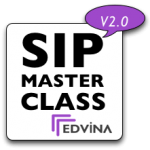 The Edvina SIP Masterclass is a training that teaches you Kamailio and the SIP protocol from a beginner’s level. You want to have some experience of VoIP and Linux, but you don’t need any experience of running Kamailio – the Open Source SIP Server. The spring trainings are in Oxford UK in April with our training partner Telespeak, in Miami, FL, USA in May with our new training partner USA Voip and in Malaga, Spain in July with our long-term partner Avanzada 7. In addition we are running in-house trainings where we customise the class for your needs.